Would Carlos Beltran Be This Good as a Met? Remember this guy? He was the 7-year, $119M man in Flushing until last July, when he became the bait for Zack Wheeler. Today, we get to watch Carlos Beltran swing for St. Louis. After playing out 2010 in San Francisco, Beltran settled for a mere two years and $26M to play for the Pujoless Cardinals. Through 49 games this year, Beltran is batting like the All-Star the Mets signed prior to the 2005 season. His 15 HRs match the total he hit with the Mets through twice as many games; his .594 slugging percentage is equal to his career high in 2006; his .988 OPS is 4 points higher than his career high (also in 2006). His legs must be feeling pretty good as well — he’s already swiped 6 bases, which is one less than he stole in 2010 and 2011 combinged. With Beltran belting the ball the way he is, no one in St. Louis is lamenting the loss of their formerly beloved Prince Albert Pujols — especially since Pujols is hitting only .240 with a sub-.700 OPS on the Left Coast. How has Beltran put up such big numbers through the first quarter of the season? Is he simply on a tear? Did he spend his winter drinking from the Fountain of Youth? Is he more relaxed in stress-free St. Louis? Probably, it’s a combination of things allowing this new Cardinal to spread his wings. However, one factor jumps out at me: the supporting cast in St. Louis. When Carlos Beltran hit like a superstar in Houston, it was as a #2 hitter, with sluggers Jeff Bagwell, Craig Biggio, Jeff Kent, and Lance Berkman around him. His best years as a Met coincided with people like Carlos Delgado, David Wright, and Jose Reyes all performing at their peak levels. This year, Beltran reunited with a similarly revived Berkman, plus the big bat of Matt Holliday, as well as surprisingly swift starts by Yadier Molina, Jon Jay, Rafael Furcal, and David Freese. 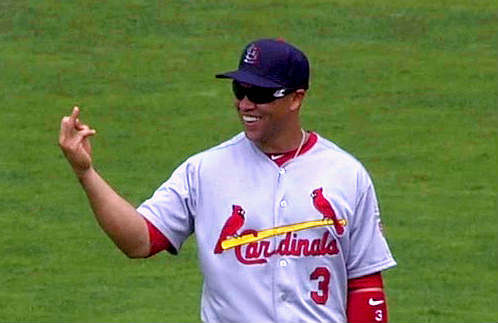 There’s no need for Beltran to be “the man” in St. Louis, because so many others are contributing. I think much of Beltran’s under-performance as a Met — in addition to the chronic injuries — had at least something to do with the perception of needing to carry the club, to be the main feared slugger in the lineup. That said, I wonder if Beltran would be performing similarly if he was wearing a Mets uniform today. Also, if Beltran were back in the orange and blue, would David Wright have emerged as the team leader? And finally, would the Mets be in first place right now, rather than looking up at the Nationals? What do you think? And, are you looking forward to seeing Beltran play tonight? How do you expect the Citi Field crowd to receive him? Should the Mets have tried to sign him last winter — or was it necessary to make room for youngsters such as Lucas Duda, Kirk Nieuwenhuis, and Mike Baxter? Post your feelings in the comments. Mike Pelfrey‘s velocity was up — his fastball was hanging around 92-93 MPH, touched 94 — but his command was poor. How can a pitcher have poor command and yet not walk anyone? Because command means putting the ball where you want it, and even though Pelfrey threw plenty of strikes, I don’t believe he was hitting the spots he wanted to hit within the strike zone. Further, he fell behind on the count often, and would respond by throwing the ball over the middle of the plate — which is why he was hit fairly hard in the first few frames. What I did like was it appeared as though Pelfrey was consciously trying to stay a little taller during his leg lift, and trying to hold that nice upright posture as he came out of the leg lift and began the stride. That tiny adjustment by itself may have contributed to his increase in velocity. The other disappointment was the lack of off-speed pitches. Maybe he was working on his fastball, which is understandable, so I’ll give him a pass. He did spin a handful of overhand curveballs that had promising vertical break, which was encouraging. But the closest thing to a change-up he displayed was a 88-89 MPH sinker. Lucas Duda nearly knocked over the batter’s eye with a bomb over the center field wall. I don’t think he could possibly hit a ball harder. Ike Davis also went yard, though not as impressively. However, it was nonetheless nice to see him drop one over the opposite-field fence. The Davis and Duda Show may be the one to watch this summer. Jordany Valdespin continues to look like a Major Leaguer. What Major Leaguer, and at what position, I’m not sure, but he looks like one. For some reason Carl Everett, Tito Fuentes, and Willie Mays Hayes come to mind. I’ve come to the conclusion that Mike Nickeas looks like someone who is playing the part of an opposing ballplayer in a baseball movie. Don’t ask me why, but I can easily see him coming to the plate against Ricky “Wild Thing” Vaughn or Nuke LaLoosh. Frank Francisco continues to look unlike a closer. That’s it for me. What did YOU see in the exhibition? Post your notes in the comments. I would not want to be in the home-team clubhouse with Tony LaRussa after this ballgame. I might prefer Chinese water torture, or peeling off my fingernails with a pair of pliers. But, the St. Louis fans were very pleased with the effort that their boys put out. Willie Harris is rewarded for his excellent efforts last night. I cannot quibble with that decision, but the fact Harris is batting fifth kind of encapsulates the Mets 2011 season, doesn’t it? Nice to see New York native Mike Baxter getting the start in right field. Not nice to know Lucas Duda is out of the lineup, considering the Mets’ recent history with concussions. It’s official: the Mets will finish the 2011 season with a losing record. Great job, guys. Don’t worry about the won-loss record, all that matters is you battled. Yeah. While we’re waiting to get the official word on the Carlos Beltran deal, you may be interested to know that the Cardinals have traded young centerfielder Colby Rasmus to the Blue Jays in return for Edwin Jackson, Octavio Dotel, Marc Rzepczynski, Corey Patterson, and either players to be named later or cash considerations. In addition to Rasmus, the Cardinals also dealt Trever Miller, P.J. Walters, and Brian Tallet. Jackson had been acquired by the Blue Jays only hours before the Rasmus deal, in a trade with the White Sox that also netted Mark Teahen and sent back Jason Frasor and Zach Stewart to Chicago. I have to say I’m stunned that the Cardinals received as little as they did for Rasmus. Though they acquired several players, none of them will have an impact in St. Louis beyond this year. I realize that Rasmus had a major personality conflict with Tony LaRussa and his teammates, so I understand why he was traded. But what I don’t get is why the Cardinals didn’t insist on getting at least one youngster who is a potential stud. It reminds me a little of when the Mets traded Scott Kazmir, in that we understood that they wanted to ship off the young lefthander, but why not get something better than Victor Zambrano in return? Looking at this trade from the perspective of a Mets fan, I wonder if Sandy Alderson would have been able to obtain Rasmus from St. Louis in return for, say, Mike Pelfrey and Jason Isringhausen? Or maybe Chris Capuano, Angel Pagan, and Tim Byrdak (or Isringhausen)? I personally am hesitant to believe that Rasmus would have been a good fit in New York, but his raw talent is such that I’d do either of those deals in a second. Baffling to me that the Cards did this deal and didn’t get back a package that would provide more long-term impact. Also, the timing was awful. If they waited until after Beltran was traded, they likely could have elicited competition from more teams bidding for Rasmus’ services — because with Beltran off the market, there are less big outfield bats available and many teams looking to add one. What are your thoughts? Did the Cardinals make a bad deal? Would you have made a play for Rasmus?